Achtung: Wegen großem Interesse wurde der Veranstaltungsort geändert! Attention: Due to high demand, the location of the event has been changed! Unser kommender Typostammtisch findet ausnahmsweise, aus gutem Grund, an einem Mittwoch statt: dem Vorabend der diesjährigen TYPO Labs. Zur Einstimmung auf drei spannende Konferenztage haben wir David Březina von Rosetta Type zu Gast. David stellt das Rosetta-Team (hier im Interview) mit aktuellen Projekten vor und erklärt, wie sie Arbeitsweisen, Workflow und Tools – Stichwort Editor-Unabhängigkeit – so organisieren, dass eine relativ kleine Firma große Custom-Font-Projekte bewältigen kann. Dabei geht er auch auf Fragen schriftsystemübergreifender Gestaltung und Harmonisierung ein. Im zweiten Teil spricht er über seine Doktorarbeit: „Koherenz in der Schriftgestaltung“. Warum ist es schwierig, zu definieren, was verschiedene Buchstabenformen miteinander verbindet, und warum wäre es gut, Ähnlichkeitsverhältnisse flexibel und wiederverwendbar bestimmen zu können? Gestaltung und Lehre könnten davon enorm profitieren; zudem stellt sich, so David, dank jüngster Erkenntnisse im Bereich „Deep Learning“ die Grundsatzfrage, was Schriften sind. Achtung, wir treffen uns im Büro von LucasFonts in Schöneberg und freuen uns auf ein internationales Treffen mit regem Austausch: weniger zu den Fonttechnologien selbst (dazu ist in den Tagen danach ausgiebig Zeit), sondern über Arbeitsalltag, Kundenwünsche und Forschung. Our next Typostammtisch Berlin will be on Wednesday before Typo Labs: as a perfect start for some super interesting days, and opportunity for conference guests to connect with the local type crowd. Happy to have David Březina of Rosetta Type as our speaking guest! David introduces the Rosetta team, talks about recent work and how they set up their workflow and tools. Preferring an editor-independent font production process, the relatively small company is able to tackle large custom projects. David will also cover questions of multi-script design and harmonisation. 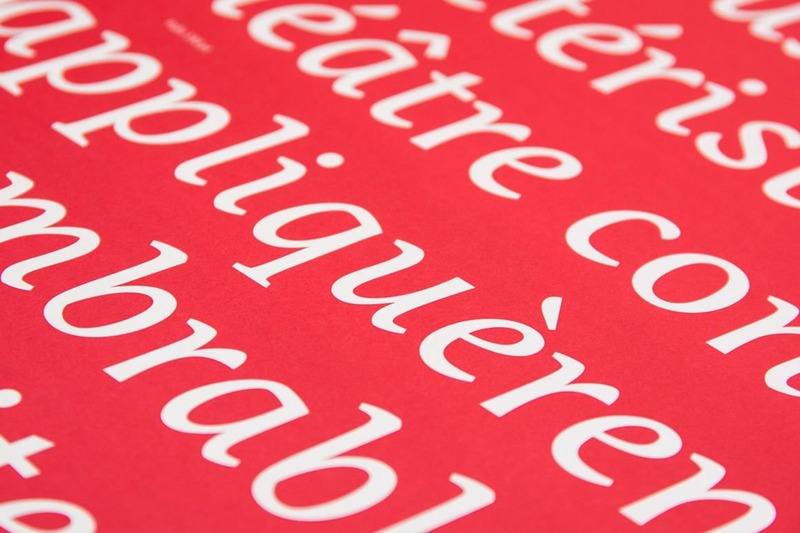 The second part is about his PhD research on coherence in typeface design. Focusing on the difficulty of finding relations between character shapes, David explains why it would be great if these relationships could be formalised in a flexible and reusable way: it might help to design and teach type more effectively, plus, with recent advancements in deep learning, lead us to rethink what typefaces actually are. We will meet at the office of Lucas de Groot’s foundry LucasFonts in Schöneberg – hoping for a lively exchange: not so much about technologies (plenty of time the days after), but about daily business, clients demands and research. The exhibition Writing Pictures – Picture Writing. Chinese Poster and Book Design Today about the emergent graphic design scene in China and Hong Kong, presented in the Berlin Kunstbibliothek – find out about their spectacular graphic design collection (would take some days, actually). For German speaking audiences: On 4th of April, the Staatsbibliothek presents Zwischen Handwerk und Industrie: Der Verlagseinband des 19. Jahrhunderts, a talk by Thomas-Klaus Jacob. Starting on April 1st, the exhibition BERLIN.STADT.MAGAZIN focuses on the design and history of Berlin’s city journals “tip” and “Zitty”. Our legendary Buchstabenmuseum (Museum of Letters) is closed at the moment, but we cannot not mention it: remember to go there next time to see Barbara Dechant’s exorbitant collection of original shop front letter signs. And then there is the wonderful Museum der Dinge (Museum of Things), which chronicles the product culture of the 20th and 21st centuries, mostly from the archives of the Deutscher Werkbund (founded in 1907). Or just walk around in the here and now of Berlin to find typographic signs all over the place. For inspiration you might like to follow @Berlin_Type, @hardwig or have a look here. Die Titelzeile wurde in einem noch unveröffentlichten Schriftenfwurf von David Březina gesetzt. Das Foto zeigt ein Detail des Rosetta-Schriftmusters für Nassim von Titus Nemeth.